The coming second | sweet juniper! I guess I just always expected we would be the parents of an only child. It seemed like everywhere I looked I saw well-heeled couples with one kid, wearing a school uniform perhaps, well-groomed, and discussing, say, a Samuel Beckett novel over dessert at a patisserie in a fashionable neighborhood somewhere, the child skipping while holding one hand of each parent on the walk home. And then there were the rest: the multi-childed, the people pushing double-wide strollers in strip-mall parking lots with swarms of children rolling around them on those roller-shoes, or signaling despair with shoes planted with flashing red lights deep in their soles. I had convinced myself we were never going to join that tribe, those Bedouins you see in airports, with their caravans of stuff. I was fairly certain we were never going to need a minivan. Last night I put my hand on my wife's swelling lower abdomen while she was sleeping. Far too small to feel anything move in there now, I knew, but still it is in there, slouching towards Detroit. I just wanted to feel the swell. It had all the weight of inevitability. There is a familiarity to all this now that has drained me of much of the awe of the last time. 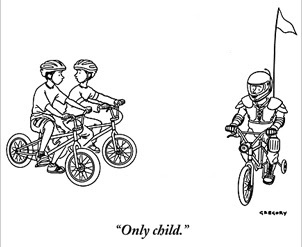 As I spooned her with my hand there, I remembered this New Yorker cartoon that I think I first saw when I was thirteen. [Someone had donated several years of New Yorkers to the free bin at the local branch of the public library, and I took them all, exposing myself to as much false profundity of contemporary fiction, outdated off-Broadway show reviews, and wry one-liner cartoons as I could before my parents took them away from me out of fear that I might grow annoyingly cosmopolitan.] Something purely biological overtakes me from time to time, an evil strain of what ifs that press me to propagate. The world is such a dangerous place; the future, so unknown. Things fall apart. You should have more than one, this relay of snapping synapses and inexpressible urges tells me. Just in case. Besides, I asked myself, thinking of my wife (an only child) and the exhausting and sometimes oppressive parental love she still receives on a daily basis, can you really pin all the pressure of love from two parents on one fragile being? But then, of course, there is my own experience: as an older brother I tapped into the same well of pitiless human cruelty that surely inspired medieval inquisitors, eighteenth-century satirical poets, and Karl Rove. To see Juniper handle siblinghood as poorly as I did would surely break my heart. I fell asleep. This morning, hours later, this has been hard to write about. We couldn't write about any of these long-simmering emotions while we still held our secret close. I suppose I have been a little ashamed, given the way Wood has (accurately) portrayed my fears of having a second child. It's complex, and scary; I don't want to whitewash anything out of concern that this new child might one day read it. The fact remains that I am far less frightened of the coming of this second child than I was of Juniper. I was a real piece of work during her gestation. And all my stereotypical fears from back then turned out to be true: she was going to change my life forever; nothing was ever going to be the same; our lives weren't going to be just about us anymore; not only would I be the guy who talks only about his kid, I would write about her, too; etc. The surprise is I never would have expected to be this happy with the realization of all my fears.